There’s nothing quite like warm, soft rolls right out of the oven, or the mouthwatering aroma of freshly baked sweet bread. 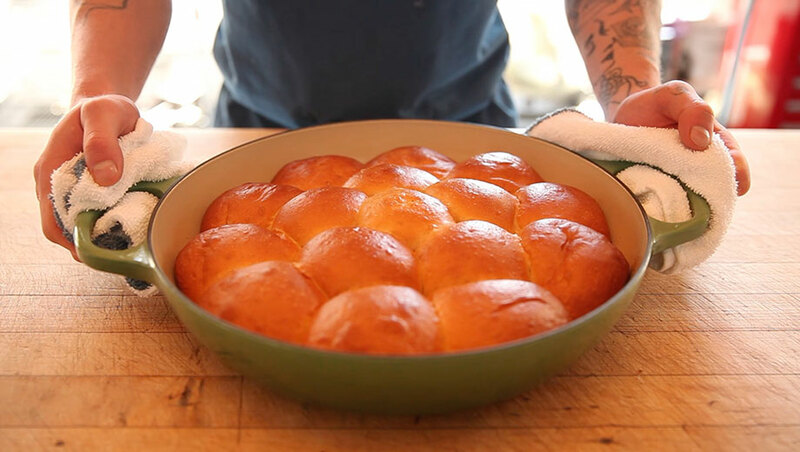 This recipe was inspired by King’s Hawaiian Sweet Bread, which has been a fixture of island life since the 1950s. We wanted to create a version you can make at home. After all, the deep citrus notes in sweet bread resonate especially well when it’s served fresh. Ours are deliciously supple throughout, with a tender, golden-brown crust and a distinct fresh-baked flavor that you just can’t get out of a package. The tale of this light-textured and subtly sweet bread dates back much further than King’s and takes us to the other side of the world. Portuguese sweet bread is the prototype: yeast-risen; made from flour, milk, eggs and honey; and perfumed with a touch of lemon zest. Historically, this was an expensive bread, reserved for Catholic holidays like Christmas and Easter. So how did a festive bread from Portugal travel across two oceans to reach a Polynesian archipelago in the center of the Pacific Ocean? Supply and demand. Hawaiian sugar plantations had an insatiable need for fieldworkers, and in the mid-nineteenth century, Portugal’s dismal economy drove families to emigrate in search of better futures. When a fungal blight struck the vineyards of Madeira in the 1850s, the Hawaiian government was only too happy to pay for the agricultural fieldworkers to make the six-month ocean voyage in exchange for at least a year of work in the sugar fields. It wasn’t long before Portuguese immigrants quickly swapped honey for sugar in their traditional sweet bread. And with sugar plentiful on the islands, this bread quickly became an everyday treat. Sweet bread wasn’t the only lasting import that came with the Portuguese: they also brought the ukulele. This four-stringed instrument became just as popular as sweet bread and created the musical soundtrack synonymous with living the sweet life in paradise.